True statements from Mr. Kennedy. Where does the decision rest in South Africa? Shall we also sacrifice democracy? 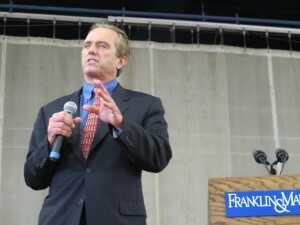 Robert F. Kennedy Jr. is one of the nation’s biggest opponents of coal as an energy source. He believes natural gas is just as damaging to the environment. As an environmental activist, Robert F. Kennedy Jr. is one of the nation’s most vocal opponents of coal, but he thinks natural gas is just as bad. Speaking to a crowded auditorium today at Franklin and Marshall College in Lancaster, Kennedy says it’s a “false choice” to weigh economic concerns against environmental protection. Although his speech mainly focused on reducing the nation’s reliance on coal and shifting to renewable energy sources like wind and solar, he sat down with StateImpact Pennsylvania to talk about his views on natural gas development. Q: It’s been widely reported you’ve had a lot of discussions about gas drilling with your former brother-in-law Governor Andrew Cuomo (D- New York). Would you say you’ve been a big influence keeping fracking out of New York? A: No. There’s 50,000 anti-fracking activists in New York. Those are the people. And Governor Cuomo so far, has kept fracking out. Not me. Q: What are your concerns with it? You’ve said you were an early champion of natural gas. A: From what I now understand about natural gas—it’s a catastrophe. Q: How is the gas industry doing here in Pennsylvania? A: I’ve been to Dimock and I’ve seen the impacts on the local communities. I think it’s a disaster for Pennsylvania and I think [the industry] has subverted democracy in the state. They promised they would pay for their own regulations. The fracking tax was meant to pay for that. [Governor Corbett] is giving a huge subsidy to the gas companies that the Pennsylvania public will have to pay for. He’s stealing from the commons, which the Pennsylvania public owns. Q: One of the things you’ve cited are the potential public health impacts of gas drilling. You’ve pointed to the Geisinger Health studies as something New York should look to. Those efforts are just getting underway, and there may not be conclusive results for years or decades. Do you still feel like New York should wait? A: I think we should wait until we have the information, if it’s going to be damaging to public health. This is what Governor Cuomo has said. The fracking industry should pay its own costs–if it’s allowed to happen [in New York}– which means they should be removing 100 percent of the methane. They should have regulatory supervision to make sure that there’s no leakage of any damaging chemicals into the water table. They should properly dispose of their waste. They should not be allowed to use fresh water without replacing it. And they should pay for the road damage, which costs hundreds of millions of dollars per year. And if they did that, there’s no way they could compete with renewables. Q: You’ve been a vocal opponent of coal. Despite the risks of gas, do you think it’s better than coal? A: I think they’re pretty even in terms of their culpability for public injury. Q: From a climate change perspective, scientists say more data needed to understand methane leakage to see if gas is indeed a net benefit to the climate. The latest study, funded largely by the industry said the leakage rates are low. Do you feel like, even if the rates were high, it’s a solvable problem? A: The University of Texas study studied only the wells that were being highly supervised. So it studied wells that were experimenting with new technologies that are not industry-wide and not required for the industry to see if they could reduce methane rates, and indeed the rates were lower. But what that says is if you’re going to reduce methane, you need to have supervision of every well. Q: But if leaks are a solvable problem, isn’t gas better for the climate than coal? A: It depends. If that is widely adapted and it is enforced, and then you can say, “It’s less damaging to the climate.” But it still leaves a lot of other problems that make the industry pretty untenable. « Fracking benefits the poor? Don’t think so.